Local Maryland Attorneys Celebrate More Than 30 Years Of Practice - Schochor, Federico and Staton, P.A. 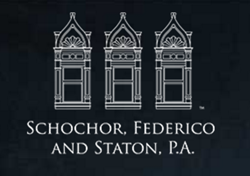 The law firm of Schochor, Federico and Staton, P.A. is celebrating more than 30 years of representing victims of medical malpractice. Composed of a distinguished group of experienced attorneys and superior staff, the firm helps clients and their families receive justice after being victimized by negligent health care providers. When someone puts their health in the hands of a professional, they expect to be treated properly and with respect. “When someone puts their health in the hands of a professional, they expect to be treated properly and with respect. But doctors, nurses, hospital staff, and trusted providers can make mistakes, the worst of which result in catastrophic injuries and even death,” says firm senior partner and Baltimore medical malpractice lawyer. According to the practice’s group of skilled lawyers, medical malpractice can occur in most any health care setting such as in an emergency room, the operating room, a nursing home, or even in a doctor’s private primary care practice. Schochor, Federico and Staton, P.A handle cases involving medical malpractice including birth injuries, surgery mistakes, and missed or delayed diagnoses. The Journal of American Medical Association released a report in May of 2016 that concluded medical negligence is the third leading cause of death in the United States. Heart disease and cancer took the number one and two spots, respectively. About Schochor, Federico and Staton, P.A. The law firm of Schochor, Federico and Staton, P.A. fights for medical malpractice victims and their families against hospitals, nursing homes, and other medical facilities and professionals who fail to deliver adequate care. They work as a team to obtain maximum compensation for their clients and to restore the highest quality of life possible. Together with a seasoned support staff, the attorneys at Schochor, Federico and Staton, P.A. launch a full-scale investigation to prove a direct link between the victim’s injuries and the negligent medical conduct. Their practice has the resources and expertise to take on complex cases and class action lawsuits. The firm’s attorneys have been honored by leading industry organizations, including Best Lawyers ®, Super Lawyers ™, Newsweek’s Premier Law Firm of 2016, and AV Preeminent by Martindale-Hubbell. Jonathan Schochor has been honored as the 2016 Lawyer of the Year – Baltimore Medical Malpractice Law by Best Lawyers. Additionally, Schochor, Federico and Staton, P.A. have recovered more than a billion dollars in settlements and verdicts on behalf of their clients. Thanks to more than 30 years of dedication and service, Schochor, Federico and Staton, P.A. has been successful throughout Baltimore, the State of Maryland, Washington, D.C. and other states.